It has been a bad year for press freedom across Southeast Asia. Myanmar has been no exception. Media freedom fell to new lows this month as a self-proclaimed anti-Rohingya supporter, American Rick Heizman, was welcomed with open arms in Myanmar. Heizman, a little-known musician and traveller to Myanmar, made an amateur film claiming Buddhism is at risk of being overtaken by Islam. In September this year, Heizman’s video was forwarded by the Myanmar Ministry of Foreign Affairs to a range of United Nations agencies based in Myanmar. Journalists face major challenges in their efforts to uncover uncomfortable truths about what has occurred in Rakhine State. Among his claims, Heizman argues that there should be no repatriation of the Rohingya to Rakhine State. Heizman’s rants have attracted the attention of Facebook who first deleted some posts and now has suspended his account, as has Twitter. This month, Heizman claimed he was able to travel freely in northern Rakhine State to report on sites scarred by the conflict that has displaced 700,000 Rohingya. The assumption that his reporting is accurate lacks credibility, given that the areas affected by the conflict have otherwise been out of bounds for foreigner journalists. Heizman’s lone-wolf anti-Rohingya antics have seemingly been embraced by a range of local institutions and officials – the University of Yangon, the Ministry of Foreign Affairs, policy think-tank the Myanmar Institute of Strategic and International Studies, and the Rakhine National Races Affairs Minister in Yangon. His rhetoric is perceived to bolster the poorly evidenced claims from radical nationalists that the Rohingya do not belong, that the problem is one of terrorism and not of a humanitarian crisis, and that actions must be taken to protect Buddhists and the state against Islam more broadly. The collaboration between Heizman and U Zaw Aye Maung, the “Yangon Region parliament Rakhine National Races Affairs Minister”, is particularly concerning. Zaw Aye Maung hosted an event for Heizman in Yangon and praised his alleged independence. Zaw Aye Maung’s post is a sub-national level position that is designed to facilitate representation of the interests of minority ethnic groups. His role is to advocate for the interests of Rakhine people in the Yangon Region, far from northern Rakhine State. Instead, he is using his position as a platform to argue that the interests of Buddhist Rakhine people and official national races more broadly need to be protected from the Rohingya and Islam. Rather than his ministerial position potentially promoting federalism and democracy through the representation of minority interests, this incident is yet another example of how toxic the politics of national race in Myanmar has become. The Rohingya fall outside this list of official national races, and any attempt to claim such status is perceived to diminish the rights of officially recognised national races. Enter journalists. Or at least the brave few who are attempting to confront the skewed narrative propagated by foreigners such as Heizman and local officials such as Zaw Aye Maung. Journalists face major challenges in their efforts to uncover uncomfortable truths about what has occurred in Rakhine State. Despite media reforms in 2012, genuine investigative reporting on the conflict in ethnic armed areas has remained exceedingly difficult and risky. The attacks since 25 August 2017 by the armed Rohingya group known as “ARSA”, and the subsequent major military offensive in Rakhine State, have proven particularly precarious for journalists to cover. The most infamous contemporary case of restrictions and punitive measures against journalists in Myanmar is the case of two local Reuters journalists, Wa Lone and Kyaw Soe Oo. This case has garnered global attention because of their connection to Reuters as an international news outlet and because the journalists were covering what the UN Fact Finding Mission has identified credible markers of genocide. The facts of the Reuters journalist case are now well-known. While meeting with the police in late 2017, they were arrested for allegedly possessing documents that contained state secrets. In fact, they were set up by the police who were aware that they were investigating a massacre that took place in Rakhine State. It is worth noting that the police fall under the Ministry of Home Affairs, which is headed by a minister selected by the Commander in Chief of the military. On 8 February, Reuters proceeded to publish the findings of its devastating investigation into the killing of ten Rohingya men. Wa Lone and Kyaw Soe Oo were two among four of the attributed authors. In September this year, the court trial of Wa Lone and Kyaw Soe Oo culminated in a guilty verdict and a sentence of seven years jail for their alleged crime. They have since appealed and the appeal remains ongoing. In a further twist, the military admitted that its soldiers were responsible for the massacre that the two journalists had been investigating. Seven military officers were convicted for their role in killing eight Rohingya men and two boys in a military court. The court-martial hearing is an indication that the military wanted to deal with this case quickly and on its own terms. The case of the two local Reuters journalists is an example of how the military and the administration works to control the narrative about what has occurred in Rakhine State. Despite a transition from direct military rule since 2011, authorities continue to assert the right to determine the news people consume in Myanmar. Ongoing attempts by officials to control the news of atrocities in Rakhine State over the past year further discredits the claims of anti-Rohingya sympathisers. The Rakhine Minister is doing no favours to Rakhine people by collaborating with Heizman. Neither is Heizman’s trumped up visit to Rakhine State an indication of a free press. 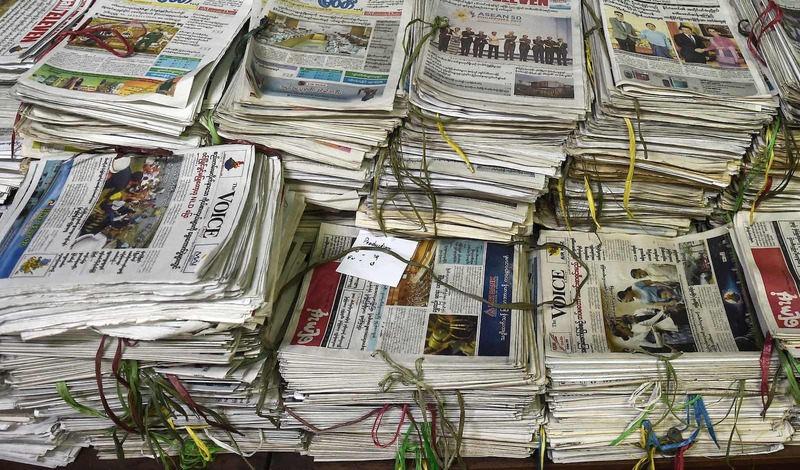 Rather, the entire affair points to the thin and fading mirage of media freedom in Myanmar. Rachael Buckland, a Research Associate in the Migration and Border Policy Project, with links on developments across the field.